The Samsung ML-4510ND is a mono laser printer that's aimed at small business users. The ML-4510ND features Samsung's innovative anti-jam technology – improving reliability and reducing the chances of paper-jams. The printer also comes with an eco-button to help reducing printing/running costs and your businesses overall impact on the environment. The Samsung ML-4510ND features a simple operating panel which includes a compass dial, a numeric keypad and a 4 line LCD display – navigating the various menus is simple and easy. If you're stuck for space, then do bear in mind that the ML-4510ND measures 435 (d) x 358 (h) x 418 (w), mm – which may put of those of you who are limited for space. The ML-4510ND comes with Samsung's anti-jam technology, whereby a special roller provides backward friction during the paper pick up process. This allows for significant reduction in paper jamming which will enable users to increase their productivity when printing large documents. 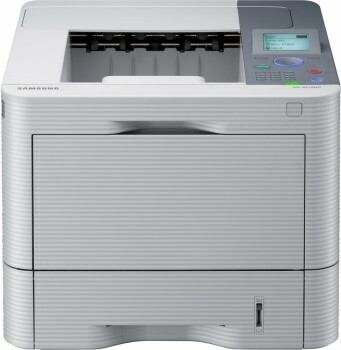 The Samsung ML-4510ND also has an eco-button, once activated; the printer automatically reverts to an economical setting which includes duplex printing. The eco-button is a great little feature that will save you money on ink, paper as well as running costs such as electricity. It will even lower your carbon footprint! The main disadvantage of the Samsung ML-4510ND is its lack of connectivity. With no built-in WiFi or Ethernet connection – small businesses will struggle to connect multiple devices to the printer.